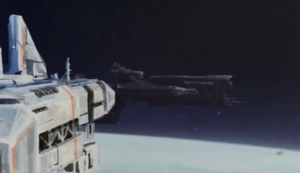 The UNSC Gettysburg was a Paris-class heavy frigate in service with the UNSC Navy during the Human-Covenant War. Built around a Magnetic Accelerator Cannon and armed with numerous Archer missile pods, the Gettysburg was a fairly typical UNSC frigate. It had an Officers' Club aboard, housing a large table of oak, which was heavily scored with numerous gouges and scorches from cigars set upon its surface. There was also a bar stocked with a number of varieties of liquor. It also housed a gold-fringed blue UNSC flag, photographs of past officers and captains of the Gettysburg, and a tin Civil War daguerreotype that displayed battlefields of charging men, cavalry and cannons. On July 17, 2552, the Gettysburg, along with the frigate UNSC Allegiance, responded to a distress signal sent by Commander Jacob Keyes from the Sigma Octanus System. The vessel later fought in the Battle of Sigma Octanus IV with Battle Group Leviathan. The vessel then returned to the orbital space dock of Reach, where it was heavily damaged in the Fall of Reach. The Gettysburg suffered a strike from an energy projector that "gutted it stem to stern" and obliterated the bridge and life support, killing the crew. However, the ship remained relatively intact, including having intact fusion reactors. When the survivors of the Battle of Installation 04 returned to Reach, Cortana began searching for a wrecked ship that had an intact reactor she could use to give the captured Covenant flagship Ascendant Justice more power. Cortana located the Gettysburg which had an intact power plant and an apparently functional MAC as well and hooked it up to the Ascendant Justice. With the additional power from the Gettysburg, now acting as the second part of a human-Covenant hybrid ship, Cortana was able to make slipspace jumps far quicker. During the battle in the anomalous slipspace field, Vice Admiral Danforth Whitcomb had Gettysburg's hanger bay pressurized and the explosively decompressed as part of a successful tactic in battle against a Covenant fleet. The Gettysburg was subsequently repaired enough to become habitable again by the time John-117 regained consciousness following his close encounter with a Covenant plasma bolt during the battle and the human crew transferred over to the Gettysburg from the Ascendant Justice. Doctor Catherine Halsey was able to use the ship's surgical suites and flash cloning banks to treat Linda-058's near-fatal injuries from the firefight on Gamma Station and Kelly-087's severe plasma burns. To make the bridge usable again, the crew welded hull plates over the blown-out windows and placed monitors over the plates. Additionally, with Ascendant Justice's reactors off-line, the two ships were relying on the Gettysburg's reactors to move which were only working at sixty-seven percent. In order to get repairs for the Gettysburg-Ascendant Justice, the crew took the two ships to the rebel base at Eridanus Secundus. After some posturing on both sides, Governor Jacob Jiles agreed to meet with them only to have a Covenant cruiser show up. Operating from the bridge of the Gettysburg, the UNSC forces attempted to destroy the cruiser with Ascendant Justice's one working plasma turret, only to have the turret misfire and burn off some of the Gettysburg's remaining armor. With no ammunition on the Gettysburg and Ascendant Justice's magnetic coils overloaded, John came up with the plan to use the magnetic coils for Gettysburg's MAC gun to shape and aim the plasma for Ascendant Justice's turret while using two of the ship's three Clarion spy drones to be able to see the cruiser coming. The Gettysburg-Ascendant Justice succeeded in destroying the cruiser, but the magnetic pulse knocked out the Gettysburg's reactor and engines but Jiles had his fleet give the ship a tow back to the asteroid base for repairs. With the help of Jiles and his people, they were able to repair Gettysburg's reactors and engines as well as conducting repairs to Ascendant Justice. Using his stockpile of munitions, Jiles was able to restock sixteen Archer missiles for the Gettysburg, but the return of the Covenant forced Gettysburg-Ascendant Justice to leave before the shakedown of the hybrid ship's systems was finished. In order to buy Earth time with the Covenant set to invade, the Spartans convinced Admiral Whitcomb to allow them to launch a first strike. With Whitcomb unwilling to risk Gettysburg-Ascendant Justice, the Spartans welded layers of lead, boron fibers and Titanium-A hull plates removed from the Gettysburg to a Spirit dropship so they could survive the transition from slipspace to normal space in the smaller craft as well as loading it up with munitions scavenged from the frigate's stores. Hours later, after rigging the Unyielding Hierophant to blow, the Spartans received the "Oly Oly Oxen Free" message and made contact with Whitcomb who explained that he had brought Gettysburg-Ascendant Justice out of slipspace on the system's edge to do some reconnaissance before deciding to do something about the Covenant fleet after witnessing its sheer size. Following Whitcomb's instructions, the Spartans traveled to the far side of a nearby moon where they found the Gettysburg waiting for them alone. Sergeant Johnson explained that while they were gone, the crew had placed Ascendant Justice's slipspace drive into the Gettysburg. Using a spy drone, the crew watched as Whitcomb and Lieutenant Elias Haverson lured the Covenant fleet in close to the exploding station with Ascendant Justice and a hologram of the Forerunner crystal, sacrificing themselves to destroy all but about a dozen Covenant vessels. Afterwards, the Gettysburg made a random slipspace jump per the Cole Protocol before finally resuming the journey back to Earth. At some point before the Battle for Earth, the frigate docked with the Borneo Space Tether and deployed Linda-058 and Fred-104. Gettysburg is named after the Battle of Gettysburg, the American Civil War battle that took place on July 1-3 1863, in Gettysburg, Pennsylvania, on Earth. This is interesting, in that it was fused with a Covenant vessel, just as the two factions of the American Civil War eventually rejoined into one country. UNSC Gettysburg is the only known UNSC ship to be fitted with a Covenant slipspace drive and be able to execute slipspace jumps without any side effects on the ship, even the ship was not equipped with energy shields. When Cortana first appropriates the Gettysburg, its stated that the Gettysburg's thrusters are off-line and the ship won't ever be moving on its own again. However, later chapters make it clear that the makeshift crew is primarily using the Gettysburg's engines to move the hybrid ship around with Cortana telling the Master Chief when he awakens on the Gettysburg that Ascendant Justice's engines are crippled.